Update: the kick-off was great; we had the whole venue packed with creative and innovative minds that provided us with great suggestions and suberbous content; we also had a nice chance to try the usage of Google Wave both to record what we said (thanks to Folletto and Dario for this) while people at home could interact “live” but it also let the discussion continue in the following days. 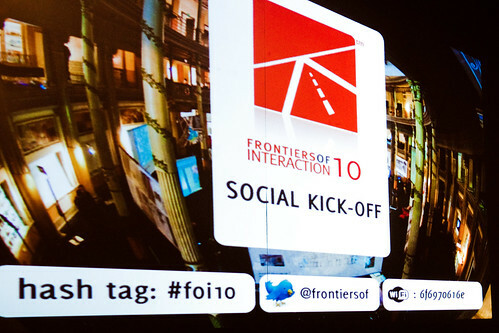 If you’re curious we have a bunch of photos on Flickr and – if you can speak Italian – here’s the answers of some of our guests to the question “What is Frontiers of Interaction for you?”. Enjoy. Next Thursday, December 17th, at 6pm we’ve organized a social gathering to introduce the 2010 edition of Frontiers of Interaction conference (note: the conference on innovation and technology I co-founded and co-produce) in Milan (Italy) at the CreacityGate (here’s the map) provided by the nice guys at 2Lifecast. How this edition is going to differ from the previous? how can we enhance the conference format? Which venue are we going to choose (and, most of all, in which city?) How could we strengthen interaction between speakers and the public? We’re plenty with such questions; and the gathering will be a great chance to help us provide the proper answers. If you’re in Milan next week don’t miss it! This entry was posted in Beef and tagged conference, foi10 by admin. Bookmark the permalink.